The "Model Training School" was opened on September 17, 1906. Four rooms of the building that is now  used by the Bowling Green Business University were designated for the purpose of training teachers. An arrangement was made with the Board of Education of the Bowling Green City Schools whereby a part fo the pupils from the first four grades of the city system were transferred to the "Model Training School." Teachers for the classes were furnished by the Bowling Green School System. They were also paid by the Bowling Green schools. The expense of maintaining the Model School, or "Training School," was shared by the city of Bowling Green and the state. This plan was followed until 1920, when the Normal School established its own independent Training School. In 1920 the Training School was brought entirely under the control of Western, and from that time forward has had no connection with the Bowling Green City School system. When Western moved to the Potter College building in 1910, the Training School moved also. At first it taught only the primary grades but by this time it included up to the sixth grade. In 1924 the Legislature gave to Western a special appropriation of $200,000 for capital outlay. This special appropriation was used in the construction of the Training School Building, which was complted in 1925 at a total cost of $243,678.34. The building was occupied in 1925. The Training School classes included from the primary grades through high school. This organization continued until 1969. In 1969, the Training School was moved to a new building and became the Jones-Jaggers Laboratory School. It began with grades one through six and in 1972 a kindergarten and special education class were added to the program. Excerpt from "History of the Jones-Jaggers Laboratory School," Feb. 15, 1971, no author. 1906 - Model School consisting of 1st to 4th grades created to give normal school students a place to get practical experience and allow professors to critique their work. 1909 - Laura Frazee named administrator. 1912 - Curriculum expanded to 1st to 8th grades. 1914 - Mattie Hatcher named administrator. 1920 - 1 year of high school curriculum added. 1924 - Legislature funds $200,000 for building construction. 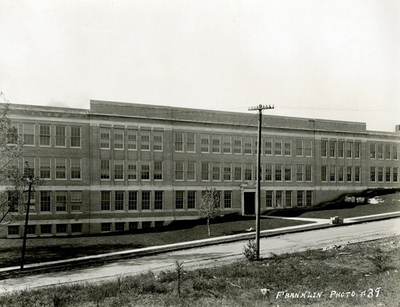 1925 - Training School building completed, becomes a K - 12 school. 1926 - L.B. Stephan named administrator. 1930 - W.L. Matthews named administrator. 1964 - High School renamed College High becomes part of the College of Education. 1966 - College High becomes University High when WKU attains university status. 1970 - Training School and University High close. Training School moved to Jones-Jaggers Laboratory School. 2010 - Re-dedication of Science & Technology Hall as the College High Building. Riley, Jason. "$26.6 Million Science Project Part of WKU's State Wish List," Sept. 14, 1999. Sisco, Scott. "Storied College High Building to Be Razed," Aug. 3, 1998. "Warren School is Dedicated," Oct. 1925.